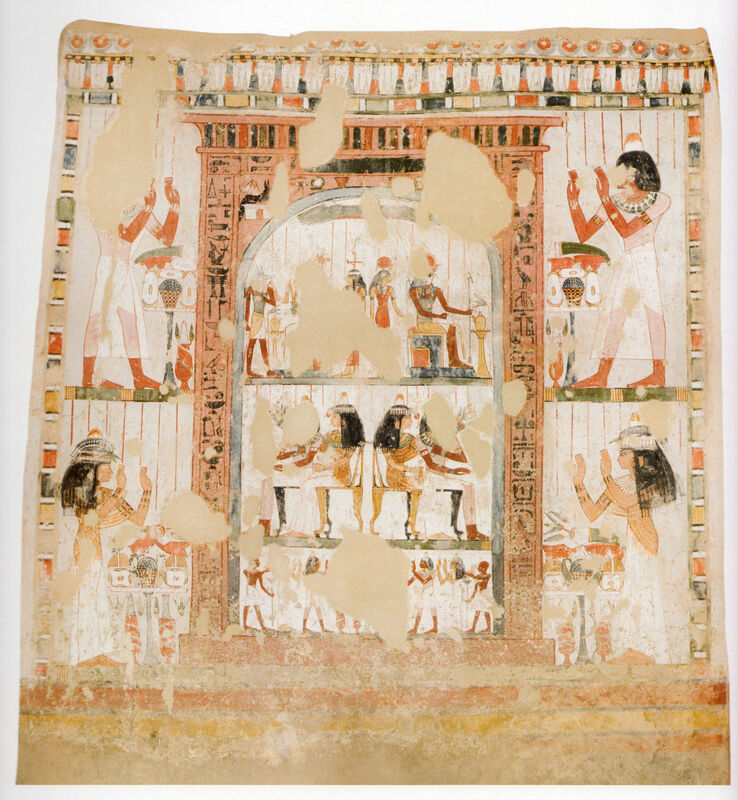 The Tomb Chapel of Menna (TT 69): The Art, Culture, and Science of Painting in an Egyptian Tomb. Edited by Melinda Hartwig. 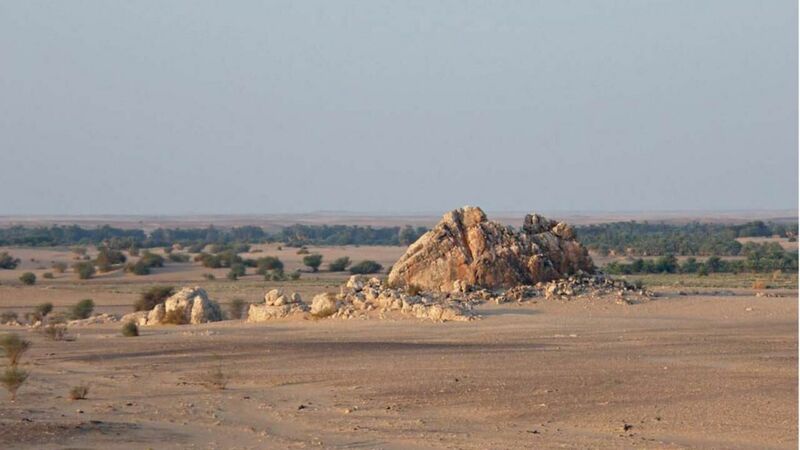 Cairo: The American University in Cairo Press, 2013. 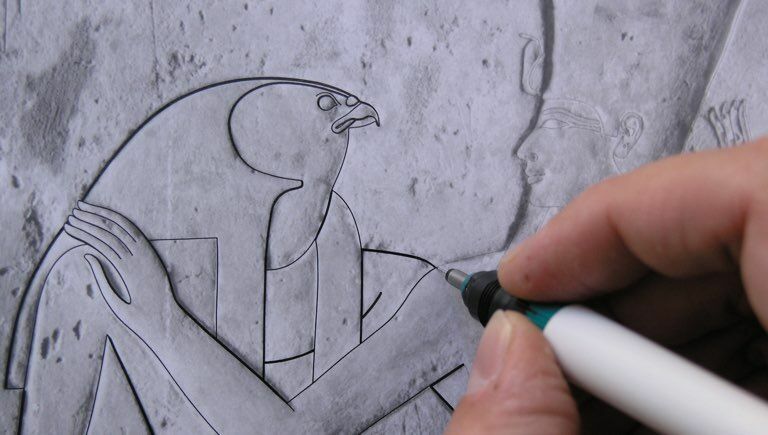 The conservation and documentation of the tomb chapel of Menna (TT 69) at Luxor was implemented between 2007 and 2009, under the direction of Melinda Hartwig of Georgia State University, with the support of USAID and the American Research Center in Egypt (ARCE). 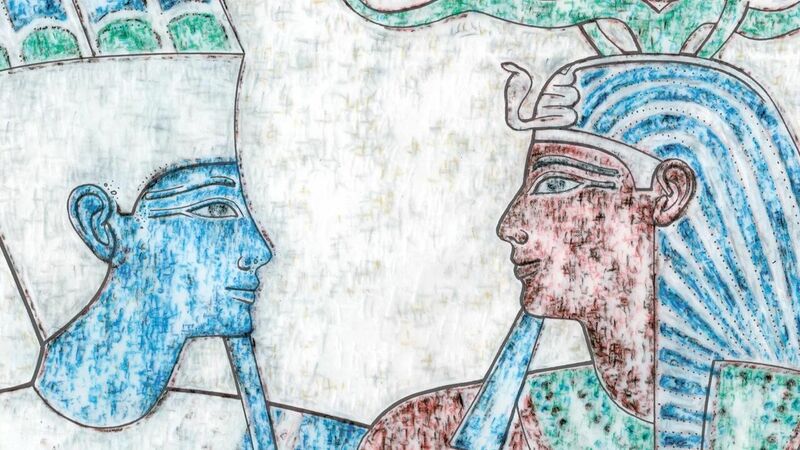 The results of this project were published in a lavishly decorated book, The Tomb Chapel of Menna (TT 69): The Art, Culture, and Science of Painting in an Egyptian Tomb (edited by Melinda Hartwig, and published by The American University in Cairo Press, in 2013). The eighteenth dynasty tomb of Menna is one of the most beautiful and complex painted tombs of the Theban necropolis of the Nobles at Luxor. 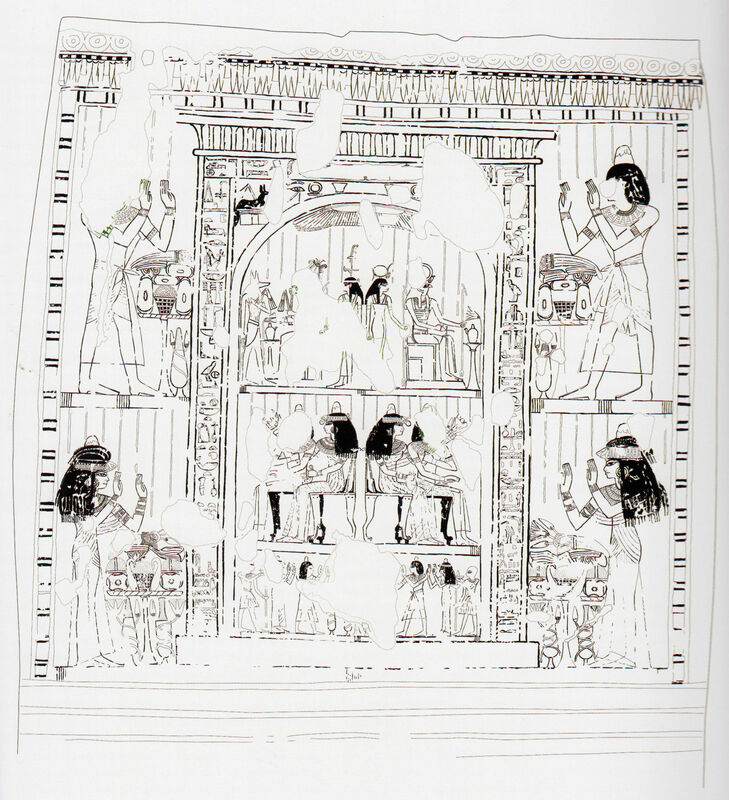 Figure 2.6a Osiris wall with (1) Menna and Henuttawy followed by two attendants adoring Osiris, the god of the underworld, seated in a kiosk; and (2) sub-scene of offering bearers and men lighting two large braziers. Broad Hall Small Left (BHSL) (Photo). 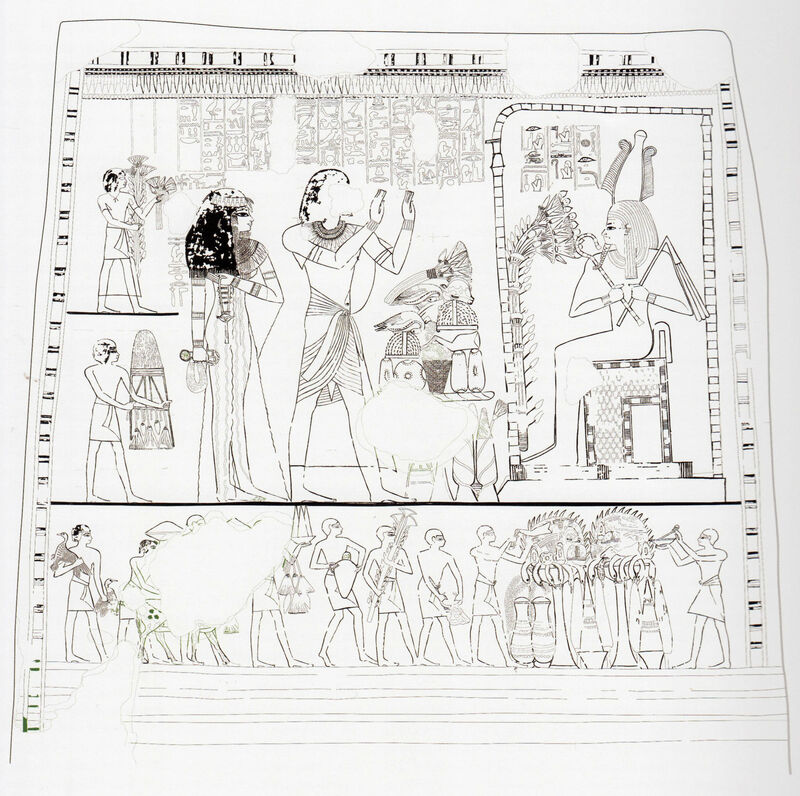 Figure 2.6b Osiris wall with (1) Menna and Henuttawy followed by two attendants adoring Osiris, the god of the underworld, seated in a kiosk; and (2) sub-scene of offering bearers and men lighting two large braziers. Broad Hall Small Left (BHSL) (Drawing). Figure 2.10a False-door stela with a cavetto cornice and offering text. 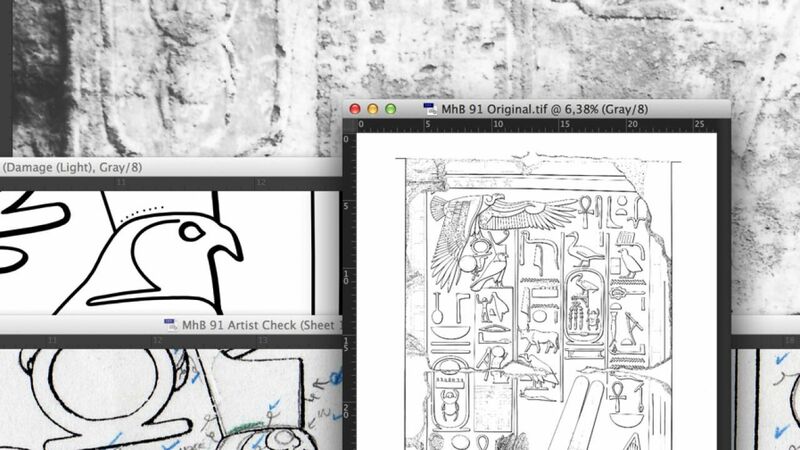 The inside stela: (1) with Anubis before Osiris and the western goddess (upper left), and Re-Horakhty with Hathor on the right; (2) middle register with two representations of Menna and Henuttawy; and (3) lower register with two sets of figures including Menna and his wife, followed by priests adoring before an offering table. At the sides of the false-door stela, figures of Menna and Henuttawy adore on two registers. Broad Hall Small Right (BHSR) (Photo). Figure 2.10b False-door stela with a cavetto cornice and offering text. The inside stela: (1) with Anubis before Osiris and the western goddess (upper left), and Re-Horakhty with Hathor on the right; (2) middle register with two representations of Menna and Henuttawy; and (3) lower register with two sets of figures including Menna and his wife, followed by priests adoring before an offering table. At the sides of the false-door stela, figures of Menna and Henuttawy adore on two registers. Broad Hall Small Right (BHSR) (Drawing). 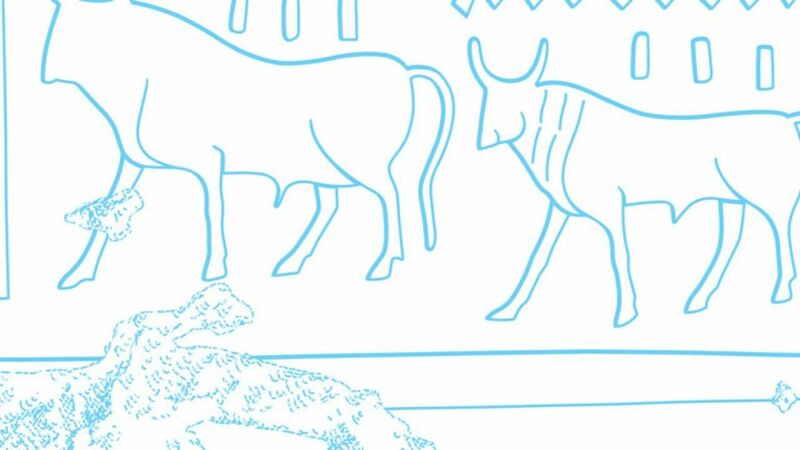 Figure 2.8b: Valley Festival wall (Drawing detail). The drawing technique (vectorized lines occasionally enhanced by a solid black fill), applied for representing the outlines of decorative elements, succeeds in capturing the distinct brushwork of the original. 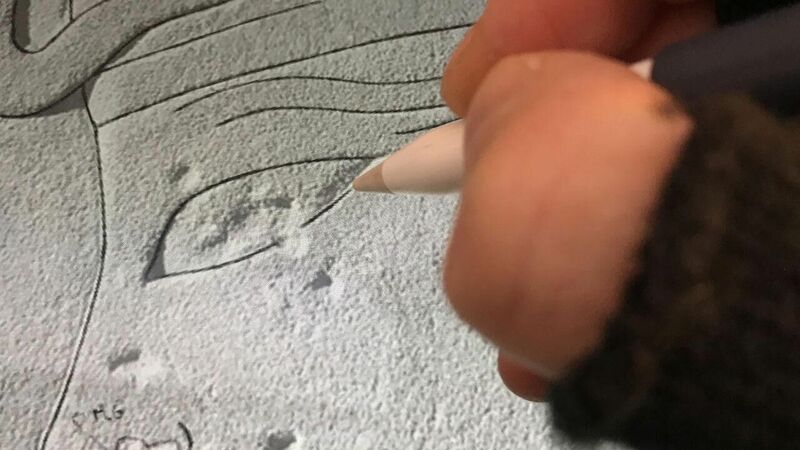 Although color representation is omitted from the outline drawings, certain elements such as damage outlines, internal details, preliminary sketches, grids, graffiti etc. 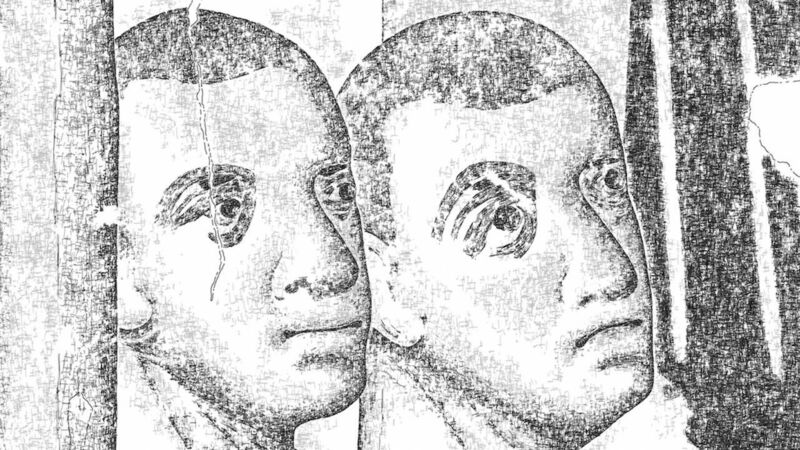 are differentiated by the systematic use of greyscale hues. 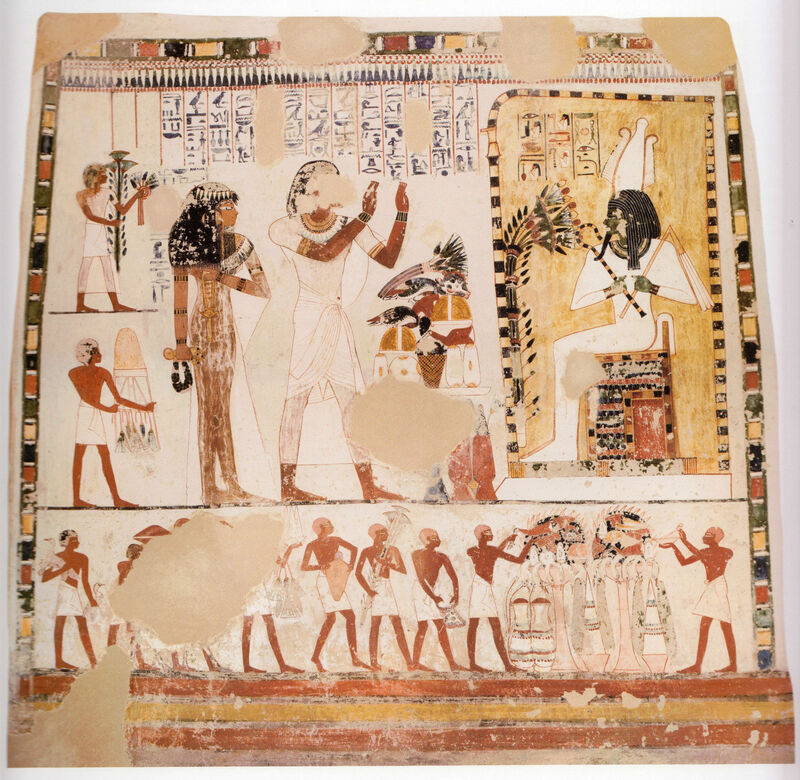 The widespread utilization of black fill concerning elements other than painted outlines (wigs, hieroglyphs etc.) creates a stark contrast with the rest of the visual representation. 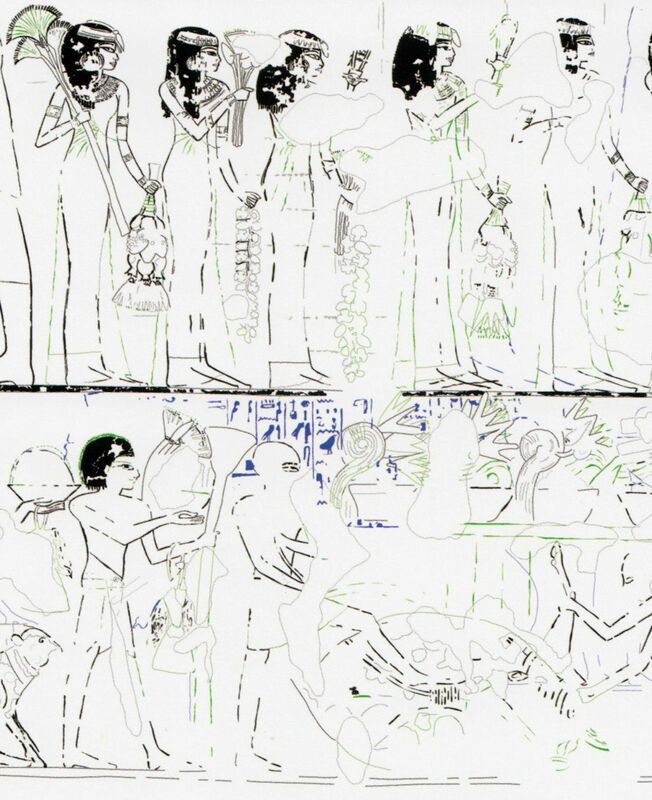 The only bright hues that appear on the drawings are green and blue which are intended to differentiate between reconstructions based on archival photographs and earlier underdrawings respectively (see Figure 2.8b). As not to be too obtrusive while keeping the focus on the decorative elements, only larger damaged areas are indicated. Furthermore, wherever represented on the drawings, their outlines are rendered by a subtle light gray hue. 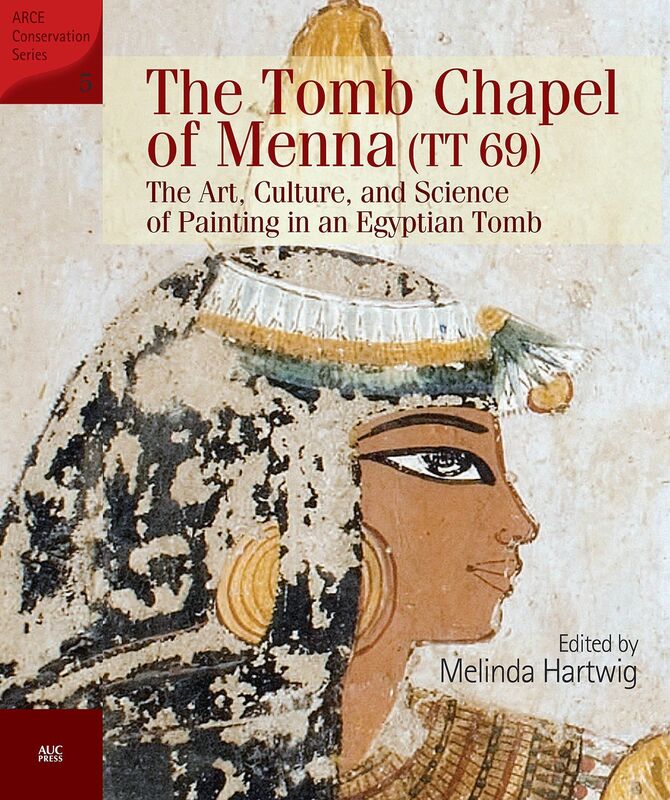 You can purchase “The Tomb Chapel of Menna (TT 69): The Art, Culture, and Science of Painting in an Egyptian Tomb” directly from the publisher through the website of The American University in Cairo Press (LE 600). It is also available via numerous retailers, American readers can order the book through Amazon.com ($58.83), while readers from the Old Continent can buy it at Amazon Germany (EUR 99), Amazon France (EUR 93.78) and Amazon UK (from £35.78).